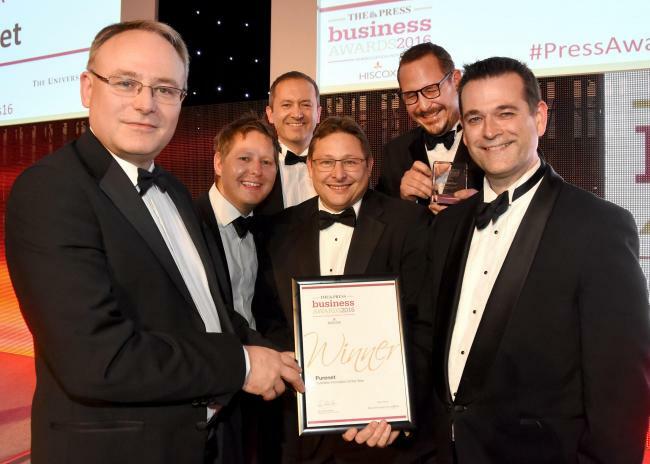 PureNet Scoops Double Innovation Win at The Press Business Awards! By PureNet PureNet News Nov 24, 2016 No Comments on PureNet Scoops Double Innovation Win at The Press Business Awards! Magento Ecommerce Agency, PureNet is delighted to announce that is has won not just one, but two awards at The Press Business Awards 2016. York, UK, 22nd November 2016 – Now in its 26th year, the awards were created to recognise outstanding achievements and celebrate all that is best in the business world featuring companies that are leading the way with innovation in York and the surrounding area. This years’ awards received more than 100 entries from across Yorkshire for the 12 categories. The spectacular awards ceremony, held on 17th November at York Racecourse, saw PureNet as the only business to scoop two single awards, Business Innovation of the Year and the coveted Technology Business of the Year. Both awards were given in recognition of PureNet’s innovative approach to using and creating technology to solve challenges and increase efficiencies for its clients. PureNet’s award entries referenced the companies’ decade of experience designing and developing, often complex, ecommerce solutions for its clients including Krispy Kreme and The Royal British Legion. PureNet has also invested in the research and development of a pioneering ecommerce personalisation software, PureClarity (www.pureclarity.com). PureClarity utilises Artificial Intelligence and Big Data to deliver personalised site search, merchandising and email marketing to online retailers in one complete platform. PureClarity has already achieved significant growth with a global client base, something recognised by the judges. PureNet’s Board of Directors were all in attendance to collect the awards. Chief Executive Officer, Dr Paul Gibson said “We are thrilled to have been recognised in such an enormous way at this years’ awards ceremony. PureNet is extremely passionate about the ecommerce and technology industry, our aim is to provide our clients with the best possible solution whether that be a seamless integration and creative ecommerce website or a highly intelligent personalisation solution.